The law requires public companies to hold annual shareholder meetings to elect directors. Before each session, shareholders receive an Annual Report, which must include company financial statements for the year just ended. The report also serves as a vehicle for company officers to comment on the company's strategy and plans for the next year. Annual reports typically include messages explicitly meant to build confidence in the company's future. What is an Annual Report to Shareholders? Publicly traded companies in most countries must publish an Annual Report to Shareholders before their annual meeting to elect directors. Regulatory bodies in some places also mandate that public companies meet their reporting requirements by filing additional, more detailed reports (see the final section in this article for more on US Form 10-K, UK Form AR01, and Canadian Form AIF). Annual Reports Serve Two Audiences For Two Purposes. The Annual Report to Shareholders can be thought of as a "State-of-the-Company-Report," with two general purposes, or two levels of meaning. Firstly, the Annual Report's official and stated purpose is to provide shareholder owners and investors with information on the company's recent financial performance and its current financial position. This information is meant, above all, to enable shareholders to make informed decisions when electing directors, and when deciding whether to buy, sell, or hold shares of stock. Secondly, the Annual Report's less official but genuine purpose targets a broader audience. The audience includes current shareholders and potential investors, of course, but also the company's employees, customers, industry analysts, and competitors. For the broader audience, corporate officers and directors intend to build confidence in the company's future. As a result, some businesspeople regard the Annual report primarily as a marketing vehicle for the company and its management. The reader's challenge—when reading any marketing message—is to decide which interpretations of historical data are reasonable or likely, and which are more speculative. Those who read the typical annual report carefully and fully will probably sense that challenge in every significant section of the document. Discussions below emphasize both the factual data and the underlying messages that officers and directors usually intend to communicate in each part of the Annual Report. "The Annual Report to Shareholders is usually a state-of-the-company report, including..."
An opening letter from the Chief Executive Officer. Financial data, to assess the company's financial position, results of operations, and key financial metrics. Notes on the financial data describing specific accounting methods and explaining the reasons for specific results. Management discussion and interpretation of topics. Market segment information: How the company defines its markets. Research and development activities on future programs. Sections below explain the contents of these items, emphasizing certain messages often built into Annual Reports for different audiences. This audience is the Annual Report's official reason for being. Reports prepare shareholders to make informed decisions when (1) electing directors, and (2) deciding whether to buy, sell or hold the firm's shares. The company is competing effectively. Management has known problems under control. Annual Reports often target this broader audience with presentations meant to build confidence in the company's future, strengthen branding, and promote company business. What are the purposes and objectives for the Annual Report to Shareholders?. How should the annual report be read? For what, precisely, should the reader search? 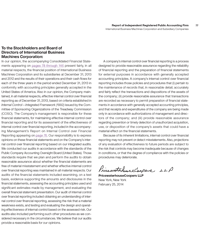 Why does the annual report include an Opening Letter from the Chairman or CEO to shareholders? What is the annual report Operating Review? Why does the annual report present "Market Strategy and Market Conditions"? What is the purpose of the Annual Report Management Discussion and Analysis? Which Financial Statements and Notes always appear in the Annual Report? What is the required Auditor's Statement and why is it presented in the Annual Report? How is corporate governance presented? How are company directors, and officers identified? What are the US Form 10-K, UK Form AR01, Canadian AIF? Selective "Earnings before ..." profit metrics: See Earnings before interest and taxes. Three margins, Gross margin, Operating margin, and Net profit margin: See Margin. ROI metrics for company earnings from capital assets and equity: see Profitability. An overview of cash flow and financial statement metrics: see Financial Metrics. 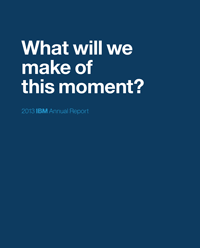 IBM published its 2013 Annual Report to Shareholders, for the Year 2013, on 25 February 2014, in advance of the company's annual shareholder meeting on 29 April 2014. "To protect investors, maintain fair, orderly, and efficient markets, and facilitate capital formation." In the regulatory context, Annual Reports are produced to enable investors to make informed decisions when (1) buying, holding, and selling stock shares, and (2) electing directors. Given contemporary report-writing styles, and the ways that reports for shareholders are written and produced, it is often said that annual reports are essentially marketing communications. In any case, current reports often look less like financial reports and more like high-quality marketing brochures—with striking images and graphics, creative typography, and glossy pages. Beyond the artfully produced pages, management comments present the company positively, emphasizing areas of competitive strength and operational excellence. Here, the intended audience extends beyond the investment community, to include the company's employees, customers, and competitors. For these audiences, especially, the report's broader purpose is to strengthen company "branding." When reporting after a stressful or problematic year, companies use Annual Report comments as a vehicle for rebuilding investor and public confidence in company management and the company's future. After a challenging year, the intended message is that management understands the reasons behind current problems, that management is acting to correct the issues, and that prospects for the future are good. How Should You Read the Annual Report? For What, Precisely, Should You Search? IBM Report 2013: Colorful graphics and creative typography make recent Annual Reports look more like marketing brochures than financial reports. As a regulatory instrument, the list of required contents for the Annual report is a short list. Usually, one or more company Directors or Officers are called upon to report and evaluate the company's earnings performance and financial position. For the first three-quarters of the twentieth century, in most places, the list of required financial statements included (a) annotated versions of the company Balance sheet and (b) Income statement. In the last few decades, however, the list of required financial statements has been expanded to include also (c) a cash flow statement for the period ended (Statement of Changes in Financial Position). Beyond these items, the only other universally mandated requirement is (d) an auditor's statement (described further below). Regulatory requirements have in mind the primary designated audience for annual reports, company shareholders, and potential shareholders. In writing, however, management has in mind a much broader audience, including also company employees, customers, competitors, industry analysts, government regulators, and the news media. All of these groups are interested primarily in two fundamental questions: " How is the business performing?" and " What are its prospects for the future?" Is the company operating profitably in its usual line of business? Does the company maintain or improve a robust financial position? Are sales revenues, profits, and market size growing? Is the company competing successfully? Is it gaining or losing market share? Does the firm make a good return on its asset base? Is the company using the best strategy for the future? Is the firm building value for owners (equity, dividends, and share price)? When reading an Annual Report for the first time, it is helpful to keep in mind that the report—regardless of structure, contents, or style—has to be understood merely as this company's chosen approach to these questions. The following sections describe significant content sections typically found in Annual Reports. Why Does the Annual Report Open With This Letter? IBM 2013 Report: The Chairman's letter uses graphics to support its central theme: "We continually remix our business toward higher-value, more profitable markets, and opportunities." 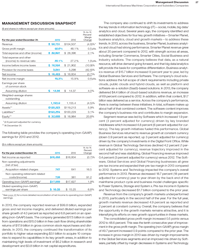 This letter or opening statement "from the top," presents a brief overview of the company's earnings performance, essential achievements (such as new product launches), competitive strengths, and areas of operational excellence. The letter may interpret these factors in the context of the current business environment or economic conditions. "IBM will remain a leader in high-performance and high-end systems, storage, and cognitive computing, and we will continue to invest in R&D for advanced semiconductor technology." "As we have learned throughout our history, the key to success is getting the big things right, innovating and investing accordingly, and challenging our organization, operations and especially our culture to adapt." "The progress we are making on strategic imperatives is highly encouraging. No company in our industry has a position as strong as 103-year-old IBM for the world now taking shape. We are confident in our vision, our strategy, and our prospects." What is an Annual Report Operating Review? IBM 2013 Report: Operating Review items are mostly "chapters," in which management presents significant achievements or examples of the company's strategy at work. The report may include one or more text items evaluating or reporting particular areas where the company intends to introduce and focus on substantial results. The report may include one or more text items reviewing or reporting specific areas where the company wants to present and elaborate on significant achievements. These items may or may not appear in a group in a section explicitly titled "Operating Review," and company officers may or may not individually sign these items. Operational improvements (e.g., productivity improvements in manufacturing). Product plans, product strategies, and product launches—past or future. Operating review items typically elaborate themes from the initial letter by the Chairman or CEO. The 2013 Annual Report for IBM, for instance, opens with Chairman's letter to shareholders ("Dear IBM Investor") and then presents three "chapters," with the following titles. 01. We are making markets by transforming industries and professions with data. 02. We are remaking enterprise IT for the era of cloud. for enterprises. And we are leading by example. Operating review items such as these are designed to showcase examples of operational excellence, management effectiveness, and—most importantly—the wisdom on display in the company's strategy. IBM's three review items for 2013 appear as "The IBM Strategy." Why Do Annual Reports Present Market Strategy and Market Conditions? IBM Report 2013: IBM can describe its Market segments in several ways, including geographies, customer demographics, customer industries, or product categories for instance. How the company defines its market and market segments. How the company describes its market strategy, and how the plan applies to different market segments. Which market segments are growing, which are stagnant, and which are shrinking. Evidence of new customer wins and strong customer relationships. Annual Reports sometimes present this information in a section or chapter of its own, with a title such as Market Strategy and Market Conditions. Or, these subjects may appear in other parts of the report. Throughout the 2013 IBM Report, for instance, starting with the Chairman's opening letter and continuing through the other major content sections, the company's market strategy and market conditions are central to the discussion. What is the Purpose of Management Discussion and Analysis? Management Discussion sections can be lengthy and detailed. In the IBM 2013 Report, this section includes 52 pages of small-type print. Management Discussion sections can be lengthy and highly detailed. In the IBM 2013 Report, this section covers 52 pages of small-print text. IBM 2013 Report: The Statement of Earnings (Income Statement) is one of four mandatory statements at the heart of the Financial Reports Section. Annual Reports are produced primarily to provide investors, owners, and others, with the information they need to evaluate the company's recent financial performance, the strength of its financial position, and its prospects for earnings in the future. The central and primary documents that serve this purpose are—in the minds of most Report readers—the annotated financial statements positioned at the heart of the Annual Report in a section usually called Financial Statements. It is accurate to say that the Financial Statements section is the Annual Report's reason for being and that most of the other Report sections are merely concerned with interpreting the financial statements. Other parts may present vital business metrics, for instance, calculated from financial statement data (such as Return on assets, Working capital, Inventory turns, or Earnings per share). In the Financial statement section, however, the source data themselves appear—along with extensive annotations. The company may or may not include some other parts of the report, and the company is free to structure these as it desires. However, the four primary financial statements—and the annotations—are mandatory. The financial statements, moreover, must conform to accounting conventions provided by the country's Generally Accepted Accounting Principles (GAAP). It is also compulsory that an independent auditor review the financial statements and issue an opinion, indicating that the reports either do or do not conform to GAAP. Note that the discussion below on financial statements describes accounting practice for companies that use accrual accounting and a double-entry bookkeeping/accounting system, as almost all public companies do. Financial results highlights typically appear in a simple table of 10-20 essential performance and financial position measures, including metrics such as net profit, operating profit, gross profit, working capital, cash on hand, return on assets, and earnings per share. A subsection or table with this title may also appear other places in the Annual report, including the Chairman's opening letter and the Management discussion section. The term earnings performance for the period refers to measures of profits and profitability on the Income statement. Net profit, for instance, appears as the Income statement "bottom line," expressed in currency figures. Profitability, on the other hand, is net profits expressed as a percentage of revenues. Balance sheet (or Statement of financial position). The Balance sheet shows, in other words, what the company has to work with for earning profits (Assets), what the company owes its creditors (Liabilities), and what the shareholders own outright (Equities). Metrics from the Balance sheet include the Debt to equity ratio, a measure of leverage applied to the company's capital structure. Leverage determines, for instance, how company owners and creditors share business risks and rewards. The timing and management of revenues and expenditures (Income statement items) are critical for reporting earnings, determining taxes, and declaring dividends. The timing and management of cash flow (SCFP items ) are critical for meeting obligations and needs: Paying employees, paying interest on loans or bonds, or investing in new product development or an infrastructure upgrade, for instance. The often-stated highest level objective for public companies in private industry is "Increasing owner value." The retained earnings statement is the "bottom line" statement on changes in owner value for the period just ended. Companies put the current results in historical context, to address questions about company growth in revenues, earnings, and metrics such as earnings per share. For that reason, annual reports typically include 10-20 year summaries of Income statement and Balance sheet results. Here, for instance, is the summary presented in the IBM 2013 report summarizing earnings per share growth for the period 2000-2013. 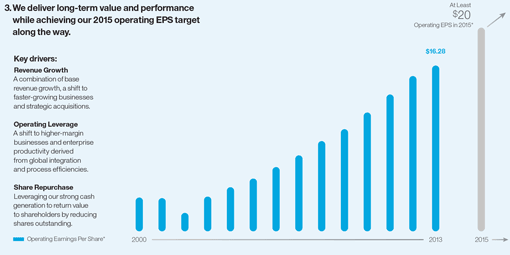 IBM Annual Report 2013: IBM earnings per share for the period 2000-2013. 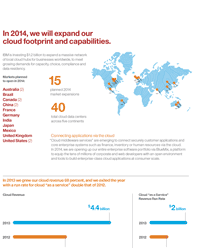 In this case, IBM communicates the "steady growth" message, along with implications for the future. The "Notes" section, incidentally, often occupies more Annual reports pages than the financial statements themselves. The IBM 2013 Report, for instance, devotes 62 pages of small-type text to "Notes on "Consolidated Financial Statements." Why is an Auditor's Opinion Mandatory for Public Companies? IBM 2013 Report: The required auditor's statement always appears on a page of its own, underscoring the auditor's independence from the company. Auditors issue an "Auditor's Opinion" (or "Auditor's Statement," or "Auditor's Report") after they review the company's financial statements and—insofar as they are able—verify the accuracy of data and the judgments of the company accountants. The auditor's comments do not pass judgment on the company's financial performance or financial position. Even with the most favorable possible Auditor's opinion (an opinion of "Unqualified"), the report assures the public only that the auditor has examined the financial statements and is of the opinion that they present information fairly and in conformance with Generally Accepted Accounting Principles (GAAP). In our opinion, the accompanying Consolidated Financial Statements appearing on pages 78 through 146 present fairly, in all material respects, the financial position of International Business Machines Corporation and its subsidiaries at December 31, 2013 and 2012 and the results of their operations and their cash flows for each of the three years in the period ended December 31, 2013 in conformity with accounting principles generally accepted in the United States of America. Also in our opinion, the Company maintained, in all material respects, effective internal control over financial reporting as of December 31, 2013. Auditor's statements such as the above typically appear on a report page of their own, close to the presentation of company financial statements. Here, PWC did not explicitly classify their judgment by name, but the statement provided to IBM by PWC essentially describes the highest and most favorable outcome for an audit, an unqualified opinion. A favorable audit outcome is necessary for acceptance by regulatory authorities, lenders (banks, bondholders, and investors). How Does the Annual Report Identify Officers and Directors? 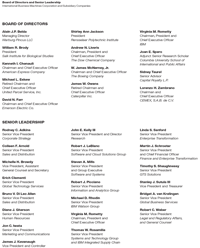 IBM 2013 Report: Governance information provided in the Annual Report includes the identities of Corporate Directors and Officers. Companies send the Annual Report to Shareholders just before their annual meetings, held to elect directors. Reports are therefore written to include, ostensibly, all critical information that shareholders need to make informed voting decisions. This information includes at least a brief description of corporate governance responsibilities and the identities of current Directors and corporate officers. The list of corporate officers usually consists of the "C" level executives (e.g., CEO, CFO, or CIO) the President, and Senior Vice Presidents. Leadership information is sometimes minimal and relegated to the final pages of the report, listing nothing more than name, position, and affiliations. Alternatively, more abundant governance and leadership information sometimes appears in the early pages and includes brief biographies, years of service, and educational backgrounds as well. In any case, however, however, leadership information in the Annual Report is not overtly positioned as "campaign" material for the forthcoming election of Directors. Overt solicitations for support in the Directors election—if present— is sent separately to individual shareholders, either by candidates or by those who are gathering proxy votes for them. Besides the Annual Reports to Shareholders, public companies in some countries must publish quarterly and annually another report that is more comprehensive and more detailed than report to shareholders. The primary audience for these additional reports includes regulatory bodies and tax authorities. In the United States, reporting requirements are mandated by the Securities and Exchange Commission, whose self-described mission is "to protect investors, maintain fair, orderly, and efficient markets, and facilitate capital formation." The SEC requires publicly held companies to produce and send the Annual Report to Shareholders before annual meetings, but the SEC also quarterly and yearly reports on SEC Form 10-K, within 90 days of the end of the reporting period. In SEC terminology, the shorter term "Annual Report" refers to the Form 10-K report. United Kingdom reporting requirements are the responsibility of the Financial Reporting Review Panel (FRRP), a subsidiary of the United Kingdom's Financial Reporting Council(FRC). The FRRP's self-described mission "...to ensure that the provision of financial information by public and large private companies complies with relevant accounting requirements such as the Companies Act 1985." The FRRP requires public companies to send an annual report to shareholders, as described above, including at a minimum (1) A Balance sheet, (2) Profit and loss summary (Income statement), (3) notes on the financial statement, and (4) a Director's report. Public companies in the UK must also file a more detailed and comprehensive report, most often delivered as Form AR01, the Annual Return. The Annual Return must be submitted each year with the registrar of companies (Companies House) within 28 days of the company's anniversary of incorporation. The Canadian Securities Administration (CS) is responsible for publishing reporting requirements for Canadian public companies. The CSA is an umbrella organization for the country's provincial and territorial securities regulators. CSA's self-described mission is "to improve, coordinate and harmonize regulation of the Canadian capital markets." Public companies that trade on the country's exchanges must send an annual report to shareholders before yearly meetings, as described above, but these companies must also file a more detailed and comprehensive report, usually delivered as an Annual Information Form (AIF). Most AIF Issuers are required to submit their annual information forms within 90 days of year-end. Other countries, however, have nothing comparable to the Forms 10-K, AR01, or AIF requirements (e.g., India, and Australia).